Group living offers some distinct survival benefits. WE’VE all seen them before, from a summer wharf or a holiday snorkel off Grand Caymen -- aggregates of swimming fishes, sometimes colourful and sometimes not, moving together in one startlingly unified mass. Schooling fishes have been observed and pondered over by humans for as long as there have been humans standing on shorelines to ponder. Like the old fisherman's joke about the herring being smarter than the rockfish (“it’s a matter of schooling”), this phenomenon of massing fishes has entered our popular lore. But while our familiarity with such behaviour is longstanding, our explanations of the same are relatively recent -- and still incomplete. Speculation on the causes and significance of schooling is largely a product of the last half century, beginning with Albert Parr's landmark studies of chub mackerel (Scombrus colias) in the 1920s. Parr was the first to formally define a school of fish. He distinguished schools from chance or temporary aggregations, calling them "the type of fish-'herd' which has an apparently permanent character and is an habitual spatial relationship between individuals." (Parr, 1927). Since then, new technologies (SCUBA, television, sonar, and submersibles) have further exposed the underwater world, while the study of animal behaviour (pioneered by Tinbergen and Lorenz) has emerged as a disciplined science. The evidence, collected in myriad forms from numerous venues, has revealed some of the answers to this mystery of mass behaviour. Schooling is one of many gregarious social systems occurring among the phyla of the animal kingdom. The great ungulate herds of Africa, flocks of birds in migration, swarms of honeybees, and shoals of squid are all different forms of group living. For fishes, schooling is a significant but not the dominant mode of sociality. Shaw (1978) estimates that 50% of fish species school as juveniles while 25% remain as lifelong schoolers. Schools of fish are found in both freshwater and marine systems and across an ecologically diverse range of species -- from planktivores to predators, from the evolutionarily "primitive" (such as herring) to the evolutionarily "advanced" (like mackerel and tuna). So why do fish school? Ethologists (those scientists who study the behaviour of animals) view behaviour as a product of evolution, just like physiology or colour. Behaviour patterns are like genetic programs which have gained prominence in a species over time and through natural selection. In this view, schooling as a behavioural strategy must produce a tangible benefit to the fishes involved or it would not exist. Group living must, in certain circumstances, offer advantages which are unavailable to non-schooling fishes. Indeed, the current literature points to three major benefits of schooling behaviour, along with a variety of less-documented possibilities. Evading hungry predators is one benefit of massing in a school. Defense against predators is the most frequently cited advantage of schooling. Several studies (Theodrakis 1989, Poulin & Fitzgerald 1989) have shown that fish will school more readily and more cohesively when exposed to predators. This response may be visual (for example, spotting a predator), or it may be biochemical. Heczcko and Seghers (1981) found that the presence of "Schreckstoff" (an alarm pheromone released by wounded fish) directly increased the intensity of schooling behaviour in common shiners (Notropis cornutus ). The old platitude about there being "safety in numbers" applies to fish schools in several ways. First, there is the so called "early warning effect" -- basically the idea that many pairs of eyes can detect a predator more efficiently than one. This multiplied vigilance has long been observed among social birds and mammals (Hoogland 1979) and has been similarly documented in schools of fish. One study of glowlight tetras (Hemigrammus erythrozonus) demonstrated that they detect predators earlier and at greater ranges as their school size increases (Godin et al 1988). Another advantage of large groups derives from the mathematics of demography, also known as the "dilution effect." As group size increases, the probability of any one fish falling victim to attack declines. Seghers (1981) outlines this ratio as being "approximately 1/N where N is the school size." Just like a Lotto 649, more participants mean a lower chance of "winning", although in this case the grand prize is patently undesirable. As long as predators remain less populous than prey and the attack rate is not excited by the existence of a school, this inverse relationship between school size and per capita risk is a tangible benefit of fish schools. Large numbers of homogeneous prey also induce a "confusion effect" in predators. Apparently, a mass of identical, moving images is visually distracting, making it difficult for a predator to focus on any one individual. The predator hesitates and is less often successful in its attacks (Landeau & Terborgh 1986). Parrish (1989) found that Atlantic silversides (Menidia menidia) isolated from their school were 50 times as likely to be attacked by black seabass (Centropristis striata) as those remaining in the group. Similarly, conspicuous individuals are more easily captured by predators. Landeau & Terborgh (1986) observed that minnows, when dyed blue, were singled out of a school by predatory largemouth bass (Micropterus salmoides). Similarly, Theodrakis (1989) determined that odd-sized minnows were attacked more often than those of average size within a school. It is hardly surprising, then, that such homogeneity exists among the members of fish school. Selection against oddity is thought to be the main reason for the lack of sexual dimorphism among schooling fishes (Landeau & Terborgh 1986). 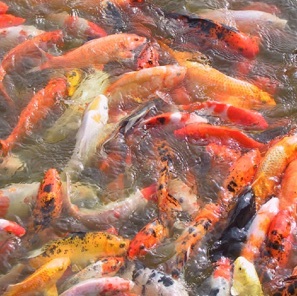 A typical feeding frenzy of koi in an ornamental pond. Group living also confers certain advantages of feeding. The multiplied vigilance of fish schools, while protecting its members from predators, also facilitates their discovery of food. Pitcher et al (1982) observed that minnows (Phoxinus phoxinus) located food more rapidly as their school size increased. This effect particularly benefits those species in habitats where food resources are patchy or unpredictable. In addition, the enhanced vigilance of fish schools toward predators means that each member of the group can spend less time in watching for danger and more time in feeding (Radokov 1973). Schooling behaviour has proven effective at overcoming the territories of aggressive fishes (Foster 1985). Robertson et al (1976) observed on coral reefs that solitary striped parrotfish (Scarus croicensis) were excluded from feeding in the territories of damselfish (Eupomacentrus planifrons) while parrotfish in schools were not. In this case, schooling fish were able to greatly expand their resource base. 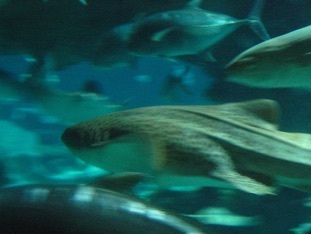 Major (1978) suggests that the schooling of predatory fish may have evolved as a countermeasure against schooling prey. He observed that jacks (Caranx ignobilis) in schools were more successful at capturing schooled anchovies (Stolephorus purpureus) than were solitary jacks, because large groups of predators are able to rapidly break up the school, isolating prey and thereby eliminating a confusion effect. Cooperative hunting is an important part of the social systems of mammalian predators, such as wolves or lions, although few examples exist among fish. Radokov (1973) cites several instances of cooperative hunting in perch. Swimming in a school also offers some hydrodynamic benefits. A third benefit of schooling behaviour stands apart from either feeding or the dangers of being fed upon. As residents of a liquid medium, fishes are subject to the laws of fluid mechanics. A swimming fish produces vortices -- eddies of current -- which surround its body and trail behind in its wake. 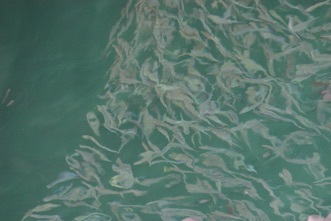 Any subsequent fish must contend with this trail of vortices which alter the resistance of the water, either increasing or decreasing the fish's swimming efficiency. Weihs (1973) demonstrated that the vortices created by fish schooling in an optimal "diamond lattice" pattern, beating their tails in antiphase, significantly reduce the amount of local friction. Fish swimming in this formation move faster and more efficiently through the water. Some debate, however, remains over whether such an optimal spacing pattern is duplicated in nature. Hydrodynamic advantages have been cited in several studies (Breder 1965, Weihs 1973) as sufficient cause for the origin of obligate schooling species. Breder (1965) also contends that the vortices produced by swimming fishes play a role in determining the acceptable size range of individuals within a school and the proximity of spacing between members. 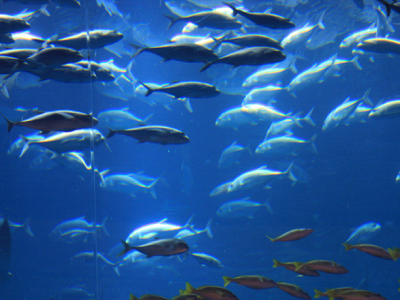 Other energetic benefits have been attributed to fish schools, including one study claiming that fishes in schools consume less oxygen than do solitary swimmers, and another which found that small amounts of mucus released by fishes into their vortex trails help to reduce drag of school members through the water (cited in Shaw 1978). Group living does not come without its costs. Living in groups, while contributing distinct benefits to its members, comes not without its costs. The compact structure of schools may indeed reduce chance encounters with predators, but other studies demonstrate that the range at which prey is detected increases with flock or school size (Vine 1973). Large aggregates of prey attract predators, sometimes in droves. As well, the intra-species competition for vital resources such as food, mates, and nesting sites also increases with group size (Pitcher et al 1982, Poulin & Fitzgerald 1989). Fish schools are not as wholly egalitarian as some researchers would have us believe. Major (1978) observed that the positions of predatory jacks within their school led to unequal access to food resources. While schooling jacks caught more prey, on average, than they would as solitary hunters, those at the front of the school were 10 times as successful as those in rear positions. Group living also facilitates the transmission of disease. Many studies (particularly with birds and mammals) have shown that the spread of communicable diseases becomes a serious problem in large social groups. Additional drawbacks, such as cuckoldry and cannibalism of young, have been observed in other gregarious species (Krebs & Davies 1987) but not, to date, in fishes. Schooling behaviour occurs in many diverse groups of fishes and offers a range of benefits to its participants. Consequently, there is probably no single reason why the behaviour has evolved. Major benefits of schooling involve predator evasion, feeding gains, and improved hydrodynamics. While these advantages are tangible and well-documented, the benefits of group living are not universal. 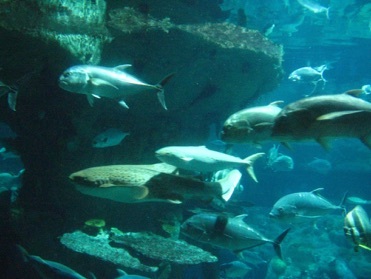 Otherwise, the number of species which exhibit life-long schooling would exceed the reported 25%. Indeed, the many predators which feed upon schools of fish -- including humans with our commercial fisheries -- demonstrate the alluring and sometimes vulnerable nature of group living. By living in a school, then, is the herring really smarter than the rockfish? The answer comes as a resounding no. Each mode of behaviour has been tried and proven, via the grand jury of evolution, to be best suited for the optimal survival of an individual species.